Ready to be WOWed? Click here to book your private appointment. (Daytime, evening and weekend consultations are available for your convenience). What would you save first in a fire? The most common answers are photographs, artwork and keepsakes. But how many people have special memories, family heirlooms or beautiful paintings stashed in a closet, under the bed or in a file box? Think about framing your treasures now before it's too late. Sadly, we've seen too many valuable items damaged or destroyed while in storage. Worse yet, we visit many homes only to discover framed pieces that have never been hung. They're still propped on the floor against the wall or leaning on the mantle. Is procrastination preventing you from framing all of the pieces you want to frame? Are you dreading the wall of samples, afraid of making the wrong choice? 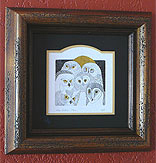 Is indecision about WHERE to hang your framed art stopping you in your tracks? Are you uncertain about HOW to hang your framed art? Don't worry! Whatever your story, we're here to help you with our unique Picture Panache custom framing process. We'll provide top-notch, professional recommendations and guidance so that you are assured your piece is showcased to best advantage. Let us create a total look that takes your art and wall décor to a whole new level. There are so many options! Looking for something unique? Just ask! Click here to book your private appointment. (Daytime, evening and weekend consultations are available for your convenience). Why accept the boring, standard mirror clipped or glued to your wall? Why settle for faux wood (plastic) framed mirrors that are not quite the right size? Why look day after day at an ugly, office-supply-store bulletin board or magnetic board? 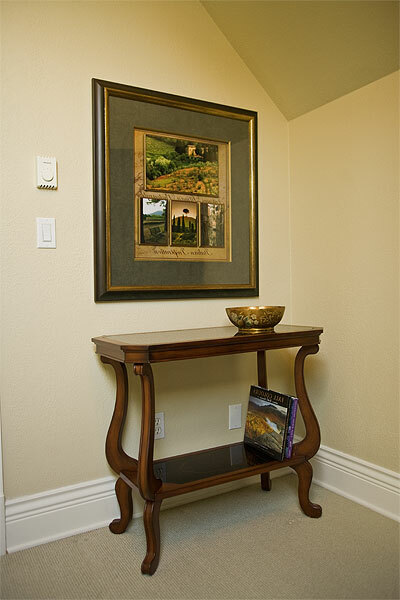 At Picture Panache Framing & Design we love to help you mix and match frames, fillets, extenders & mirrors, magnetic or cork surfaces to create the right combination for you. With exactly the right finish and exactly the right size, you won't see anything else like it at your neighbour's house or dentist's office. Looking for something stylish and striking designed just for your space? Click here to book your private appointment. (Daytime, evening and weekend consultations are available for your convenience). Our clients invest in quality frames. In order to protect your investment, we provide a FREE inspection once every five years for pieces we've framed. During that visit, we'll disassemble, inspect for condition, clean the inside of the glass and reassemble. We welcome anyone with works of monetary or sentimental importance to prevent possible damage by booking an appointment for a FREE visual inspection. Unfortunately, not all framing businesses take seriously the need to keep up-to-date with current best practices. We provide knowledge of proper conservations techniques. Accidents do happen and on occasion you'll find you've scratched a frame or broken the glass. We offer minor touch-ups on some finishes and would be happy to help with any glass replacement. Over time, our tastes often change. By altering a mat colour or selecting a new moulding, we'll help you transform your piece, so you can enjoy it all over again. Reframing can enhance any piece, so you can see it in a whole new light. We're happy to help with partial or total reframing packages. If it's important to you, it's important to us. Just ask! Click here to book your private appointment. (Daytime, evening and weekend consultations are available for your convenience). Have you ever stood in a framing shop trying to describe with hand motions the exact shade of green on your living room walls? Or have you ever had something framed and then found it really didn't look as well as you'd hoped once you got it home? Have you ever struggled carrying your artwork into a framing shop, only to stand around awkwardly waiting your turn in line? Do you have artwork or photographs you've been meaning to frame, but have been just too busy to get around to it? If you answered YES to any of these questions, then you'll appreciate our Picture Panache home/office consultations. This special and unique service makes it easier for you to get exactly what you're looking for. There is never only one right way to frame a piece and by inviting us into your home or office to discuss your framing needs, you can avoid expensive framing mistakes. Rest assured that you've finally found a way to get the colour, finish and proportions right the first time. Oh! 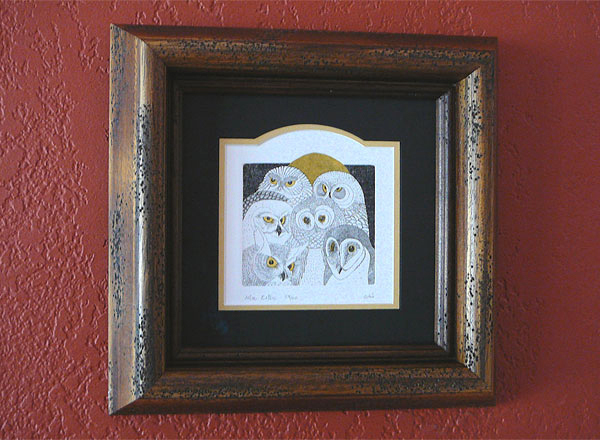 Plus, while we're there, we'll take the responsibility for safely wrapping and transporting your artwork for framing. It doesn't cost any more for us to visit you! Click here to book your private appointment. (Daytime, evening and weekend consultations are available for your convenience). Savvy business owners recognize the impact artwork can have in reinforcing and achieving corporate branding goals. Reflect the image, attitude and success you'd like to display to clients and staff. 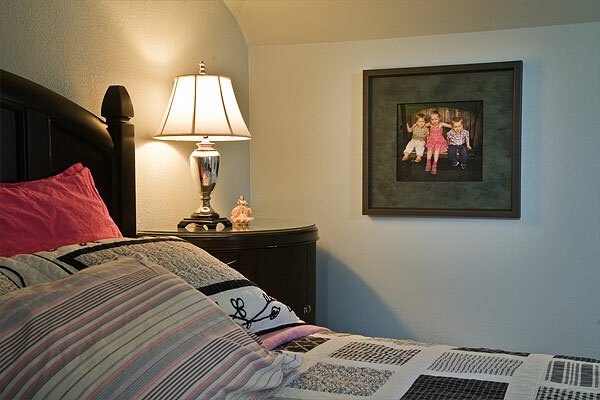 Add visual interest to your bare walls today and experience the positive results. 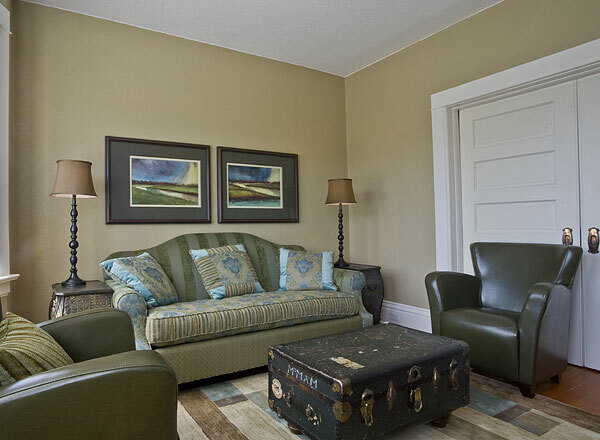 Reap the rewards of a visually appealing space. With a positive atmosphere, boost staff morale and keep those happy clients returning again and again. We work within your budget to help you express your corporate concept. Market and promote your business with the right combination of wall-mounted promotional materials, decorative and fine art. Or support local artists in your community, while creating a dynamic office environment. 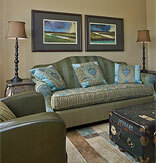 Framing and installation are important elements that complete the total look. The finished look will enhance employee morale and project a professional image. Reflect the look of success! Click here to book your private appointment. (Daytime, evening and weekend consultations are available for your convenience). Picture Panache Framing and Design is frequently called upon to serve as featured speaker for women's groups, community groups, art, photography and interior design groups, home décor businesses & educational programs. Audiences find these seminars and presentations interesting, fun, educational and entertaining. Click here to visit our Seminars page and read more! It's often confusing to place art by yourself or with the help of opinionated friends and family. "How do you think it looks here?" or "Would it look better over there?" You want it to look perfect and as a result indecision is stopping you in your tracks. Then, how do you get the individual pieces to line up perfectly without several tries and all the extra nail holes? 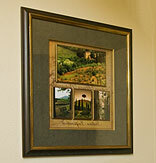 At Picture Panache Framing & Design, we offer complete art arrangement and installation services. If you've recently painted, renovated, moved or purchased new furniture... you may benefit from a fresh set of eyes to help rearrange your art. Our professional installation services are particularly useful when you need help hanging large or heavy pieces, arranging groupings, hanging mirrors, hanging wall mount shelving or hanging art on difficult to reach wall spaces. It won't feel like home until your art is on the walls! Click here to book your private appointment. (Daytime, evening and weekend consultations are available for your convenience). If you love to collect art, but dread having to patch nail holes and repaint when adding, removing or rearranging pieces, then our picture rail hanging system is perfect for you. You'll be able to easily move your art as frequently as you like. Available in a variety of finishes, the picture rail hanging system is great for both home owners and small business owners. Effortlessly add or remove pieces, or completely rearrange your wall displays without causing a new batch of nail holes. No more patching, painting or eyesores. Change up your artwork...regularly. Now, it's easy! Click here to book your private appointment. (Daytime, evening and weekend consultations are available for your convenience). If you just don't have the budget, but have your heart set on a piece of artwork you'd love to own... stop dreaming and start enjoying. 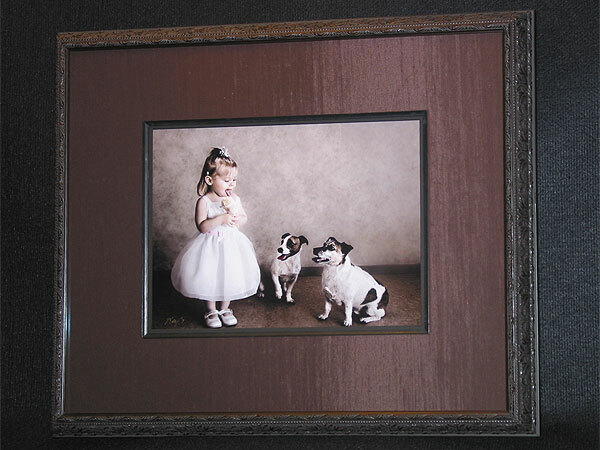 At Picture Panache Framing & Design, we help individuals get the artwork they know they want, up on the walls NOW! Start enjoying today, and budget an affordable amount each month until it's yours! Starting or expanding a business? There are so many costs involved, but even on a tight budget you can get the professional image you desire for your office. We help businesses that recognize the value of projecting the image of success and style while conserving cash flow. Staging a show home or home for sale? Creating a retail window display? Sourcing for the film industry? Need some knock-your-socks off artwork, but only on a temporary basis? We help builders, designers, realtors, event planners, window dressers, people in the film industry and others get exactly what they want for the length of time needed. Get reasonable monthly rates with flexible plans to suit your needs. Click here to book your private appointment. (Daytime, evening and weekend consultations are available for your convenience). Do you want to give a gift, but don't know what to buy? Almost everyone has something hidden in the back of their closet that they've been 'meaning' to frame. A Picture Panache Framing & Design Gift Card will be unexpected and much appreciated! Gift cards are available in any denomination. Click here to give the gift that lasts a lifetime!